With Dynamics NAV 2013 partners will have the opportunity to host Dynamics NAV on Azure. Hosting a service on Azure is different from implementing and supporting an on-premise solution and requires the partner to learn about new authentication methods, monitoring capabilities and administration tools. This session is mainly about the changes we have made to the product to enable the cloud scenario, but it will also cover how we see partners maintaining and updating a hosted NAV solution. Use this thread to post your questions, comments or things you would like to see in this session at the conference. Can you give me any pointers towards how I set up the ACS identity provider for NAV? + How does the licensing work? In the session we will go through several authentication options - including setting up NAV and ACS to use e.g. LiveID, so I hope that you will join the session. Regarding licensing terms, then I have learnt that it is better to leave that discussion to the licensing team. As a development team we just implement what is needed to fit a given license structure. So you should not expect a walkthrough of the licensing terms, sorry. Can we upload NAV Customisations to NAV on Azure? Are there any limitations in this regard? Went to this session and actually it was a session on hosting NAV on a VM. For whatever reason the real azure stuff was cut from the RTM. So no webroles, workerroles and scalabilty. In this release NAV on "Azure" means renting an Azure VM which is not even possible yet. And here I thought Kiril said "All big new ERP releases will run on Azure..."
Regarding the customizations - then yes, you can upload customizations to the Azure VM. If it is only application changes, then it will be part of the database - if you have .Net addins, then these would then also need to be uploaded to the machine. Regarding ACS configuration, then we will soon provide a blog post, that describes how to configure NAV authentication using ACS. Why this is better than classic environment? Oneclick and Nav launching and updating getting login screen but using above credentials fails with fault code "invalid security"
Ger, no problems here. I'm logged in now. There is an error: "A server error has occurred, and the content cannot be displayed. Refresh the page or open a new browser window." Anybody no problems logging in? Are there any documents (screencast, presentation) available from this session? Also you can run NAV 2009 in an Azure VM with no problems. I have installed for one of my clients 5 NAV 2009 on a Azure Virtual Machine. 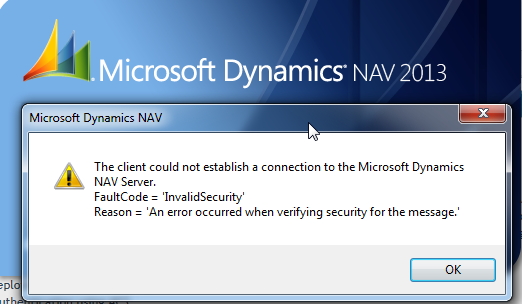 Each NAV2009 is running in a separated instance of a SQL Server because are in different localizations. Users are connecting from different countries to NAV 2009 using certificates and don't have, to be member of the domain. Managed to set up ACS for Live-Id with WebClient, but not for the Windows Client. It would be great to have access to the scripts and config-files shown at NAVTechDays2012. Been reading MSDN articles over and over, but they are not complete as regarding Azure-configuration with NAV Windows Client.